I´m newbie on the Arctic "show" and I look at the development with enchantment mingled with terror. I do not have the skills to contribute, but I am grateful that this forum and Neven's blog exists. I learn new things every day from all of you. I love the photos Espen! keep them coming. Thanks DanP, I just want to reiterate that all are welcome to make their own contribution to Arctic Image of the day thread, the more the better! I have been looking at those elaborate swirls off the east coast of Greenland for some time. What are they? It is the last stage of sea ice melt. It looks like a von Karman vortex street to me, see the link for a great animation. I was looking on Modis r05c04 on 11/7/2013 and thinking it's a clear image, then took the 250m resolution and saw it was something else. contrast to maximum and here's the result. the cloud field itself (imho, all stratocumulus undulatus) expands to the neighboring tile and is about 1000km*400km in size or about the size and shape of state of California. graphical art from NP 12.07.2013 (stiched 250m res images around NP) image area c. 445*445 km, contrast 100, brightness -90, so even a bit grey ice vanishes from the view. don't know what the 'black stripe' is. We've all had days like this!! The last sea ice of the season outside the Real Arctic Zone, Zaliv Akedemii / Akedemii Gulf Zaliv in the Sea of Othotsk. Is it my impression or did the sea ice persist very long there this year? He probably wants to go at the front so that he gets a change of scenery! Beautiful, absolutely stunning. I use them as desktop backgrounds. I belive it is the infamous Birdie Namkheng, look at post at the top! The Heat is on, open the windows please! Another image of Jan Mayen Island, notice that mustage like cloud formation. Siberian wildfires, from today's arctic mosaic. False-color shows smoke as rust-color. Hat-tip to Artful Dodger for predicting another fierce summer of Siberian fires. A massive algae blum ? On the left Swalbard, on the right Scandinavia ! It is at least 800 km in lengh and 300 km wide ! ouahou !!! I agree. I check the mosaic image daily, and I don't recall any of last year's images looking so depressingly smoky. Though last year, I think the worst of the fires was earlier, so soot may have affected melting more last year. Break in the Farrell and Arctic cell circulation? Yes that nice loop and the rest of the jet stream completely shattered ! 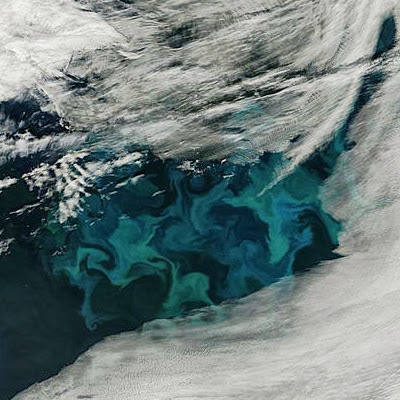 MODIS/ASTER image from July 12th, from a frame in the Beaufort sea maybe 200 km north of the Alaskan coast. Cropped image is full-resolution, 15m/pixel; full image is an overview of the 60x90km frame. This is one of a swath of 5 frames, the only set since July 1st in open access and within the Arctic. Converted from hdf using GDAL and then some gimp to combine, etc. Wow, one wonders how long it takes for that kind of ice to disappear. The take-home message I get from that is just how heterogeneous sea ice is. Each one of those crazy white lines represents a ridge, which can be up to ten times the thickness of the flat grey/brown areas in between. ~50% of the entire Arctic ice volume is in the ridges. Eyeballing that picture, however good the resolution, isn't going to tell us that much about how much ice is actually there. I guess this is why the ice models used in PIPS (and PIOMAS etc) model ice as a statistical distribution within each pixel, rather than a single value per pixel. As for your question, it would help if we had even one more picture from the same satellite to compare! Danp, where did you get it? Are there any pictures available for previous years, where the subsequent melt behaviour is known? I totally agree. It was eye-opening to see the crazy map of features at this detail level. It may be asking a little much of this data source to find truly comparable images, but because of the built-in geographic restriction, if we can find any, they will at least be from nearly the same area of the southern Beaufort. I only just decided to go digging. The dataset is "L1B Registered Radiance at the sensor" (not the expedited equivalent). The visible/near IR bands within the hdf file are 1, 2, 3N, 3B. I used 3N, 2, 1 as RGB, but you don't gain much over just a grayscale image from ch. 1, which is in the green. (3B is an offset backward-looking channel for stereoscopic images). I just repeated the search (July 1-31) as a repeated annual search since 2000 and came up with 358 results, including the 5 from this year (2 of which are right at the shoreline or just inland). So it does look like it might be a plausible project to compare ice at the southern edge of the Beaufort year-to-year in this fashion.